^ 柔佛州人口统计（英文）. 马来西亚统计局. 2017 [2018-06-30]. ^ 4.0 4.1 4.2 柔佛苏丹历史（英文）. 苏丹依布拉欣·依斯迈官方网站. [2018-06-30]. ^ 柔佛条约（英文）. 新加坡国家图书馆管理局. 2017 [2018-06-30]. ^ S. Durai Raja Singam. Malayan Place Names. Liang Khoo Printing Company. 1962. ^ John Krich. Johor: Jewel of Malaysia. National Geographic. 8 April 2015 [24 June 2018]. ^ 9.0 9.1 9.2 9.3 Ancient names of Johor. New Straits Times. 21 February 2009 [13 January 2018]. （原始内容存档于21 February 2009）. ^ 10.0 10.1 Tang Ruxyn. The Stories And Facts Behind How The 13 States Of Malaysia Got Their Names. Says.com. 26 April 2017 [13 January 2018]. （原始内容存档于13 January 2018）. ^ Facts About Johor. Johor Tourism. [27 July 2018]. （原始内容存档于27 July 2018）. ^ Abdul Latip bin Talib. Moyang Salleh. PTS Litera Utama. 14 July 2014: 34–. ISBN 978-967-408-158-4 （马来语）. ^ The origins of the word Johor. 柔佛DT足球俱樂部. [13 January 2018]. （原始内容存档于13 January 2018）. ^ Johor History. Johor State Investment Centre. 2009 [13 January 2018]. （原始内容存档于31 August 2011）. ^ Jonathan Rigg. A dictionary of the Sunda language of Java. Bataviaasch Genootschap van Kunsten en Wetenschappen. 1862: 177–. 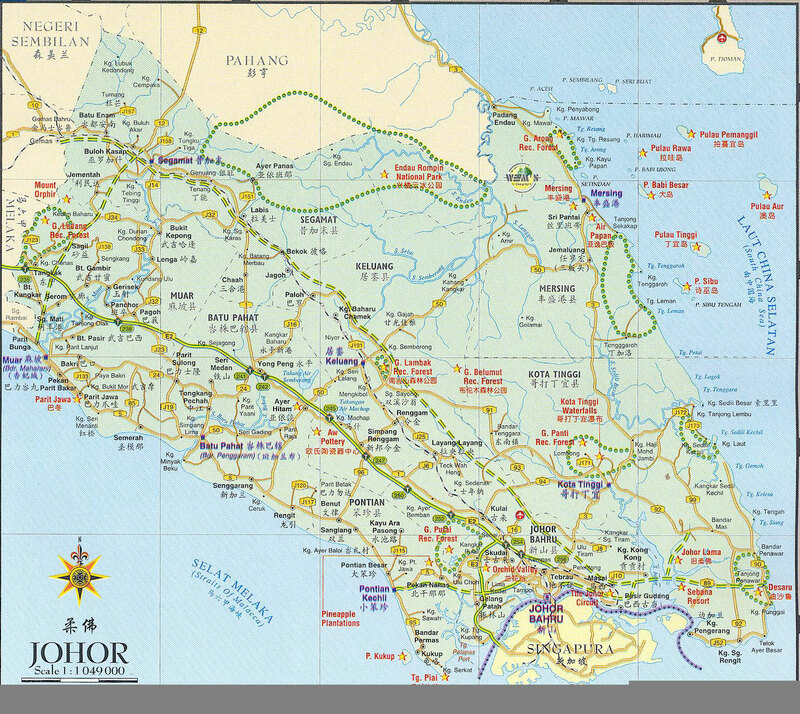 ^ 16.0 16.1 Origin of Place Names – Johor. 马来西亚国家图书馆. 2000 [13 January 2018]. （原始内容存档于9 February 2008）. ^ 17.0 17.1 旧—宰相—天猛公．柔王朝500年3朝代. 星洲日报. ^ [Bab 3] Keanggotaan dalam Badan Perundangan mengikut Undang-undang Tubuh Kerajaan Johor 1895 (PDF). 马来亚大学 Students Repository. [9 July 2018]. （原始内容 (PDF)存档于21 July 2018） （马来语）. ^ Nelson Benjamin. Honorific for Johor Sultan already in use since 1895. The Star. 12 September 2017 [9 July 2018]. ^ Tunku Ibrahim Ismail proclaimed new Johor Sultan (Update). The Star. 23 January 2010 [9 July 2018]. ^ Istana. Coronation of HRH Sultan Ibrahim. 2015 [9 July 2018]. （原始内容存档于9 July 2018） （马来语）. ^ Junita Mat Rasid. New Johor Exco members sworn in. New Straits Times. 16 May 2018 [9 July 2018]. ^ Johor Ruler: Accept the voice of the people to form the government (video). The Star TV. 事件发生在 1:56. 10 May 2018 [21 July 2018]. ^ Three Johor Umno assemblymen join Pakatan Harapan's PPBM. The Straits Times. 12 May 2018 [9 July 2018]. （原始内容存档于4 August 2018）. ^ S. Jayakumar; Tommy Thong Bee Koh. Pedra Branca: The Road to the World Court. NUS Press. 2009: 154–. ISBN 978-9971-69-457-9. Despite transferring control of its defence and external affairs to Britain, it is an undisputed fact that Johor was a sovereign State during the period 1948 to 1957, when the Federation Agreement was in force. ^ Johor crown prince warns that state may secede if Putrajaya breaches federation's terms. The Straits Times. 16 October 2015 [21 July 2018]. （原始内容存档于4 August 2018）. * Johor has every right to secede from M'sia: Crown Prince. Today Online. 16 October 2015 [21 July 2018]. （原始内容存档于21 July 2018）. * Sadho Ram. TMJ Recalls A "Dark History" In The Past But Leaves Out The Most Crucial Part. Says.com. 24 March 2016 [21 July 2018]. （原始内容存档于21 July 2018）. ^ Wide range of investment opportunities await in Johor, Malaysia. Oxford Business Group. [21 July 2018]. ^ Rizalman Hammim. Sultan of Johor voices concern over Malay 'credibility crisis'. New Straits Times. 22 November 2017 [21 July 2018]. ^ Johor Sultan alarmed over Malay crisis. Daily Express. 23 November 2017 [21 July 2018]. （原始内容存档于21 July 2018）. ^ Johor 2030 [Draf Rancangan Struktur Negeri Johor – Profil Negeri Johor] (PDF). Town and Village Planning Department of Johor: 5 [8/24]. [21 July 2018]. （原始内容 (PDF)存档于21 July 2018） （马来语）. ^ Johor 2030 [Rancangan Struktur Negeri Johor 2030 – Kajian Semula] (PDF). Town and Village Planning Department of Johor. [10 August 2018]. （原始内容 (PDF)存档于12 January 2018） （马来语）. ^ Profil Pegawai Daerah. District Office of the State of Johor. [23 July 2018] （马来语）. ^ Pusat Pengajian Pembangunan Malaysia. Panduan tugas untuk penghulu dan Ketua Kampung Negeri Johor. Pusat Pengajian Pembangunan Malaysia, Johor Bahru. 1978 （马来语）. ^ Senarai Penghulu-Penghulu Daerah. District Office of the State of Johor. [21 July 2018] （马来语）. ^ Mohd. Sarim Haji Mustajab. Malay Elite Participation in the Johor Civil Service: Its Origins and Development until the 1930's (PDF). Town and Village Planning Department of Johor: 67–82. 1993 [21 July 2018]. （原始内容 (PDF)存档于21 July 2018）. ^ Iza R. Hussin. The Politics of Islamic Law: Local Elites, Colonial Authority, and the Making of the Muslim State. University of Chicago Press. 31 March 2016: 154 and 159. ISBN 978-0-226-32334-3. ^ Barbara Watson Andaya; Leonard Y Andaya. A History of Malaysia. Macmillan International Higher Education. 11 November 2016: 208–. ISBN 978-1-137-60515-3. ^ Muhammad Kamil Awang. The Sultan & the Constitution. Dewan Bahasa dan Pustaka. 1998. ISBN 978-983-62-5980-6. ^ Local Government Department [Client's Charter]. State Government of Johor. [23 July 2018] （马来语）. ^ TABURAN PENDUDUK MENGIKUT PBT & MUKIM 2010. 马来西亚国家统计局. [2017-12-15] （马来语）. ^ Daniel J. Hopkins; Merriam-Webster Staff; 편집부. Merriam-Webster's Geographical Dictionary. Merriam-Webster. 1997: 556–. ISBN 978-0-87779-546-9. Johor coastline about 250 miles (400 kilometres). ^ [Malaysia] Vegetation description. 联合国粮食及农业组织. [27 July 2018]. （原始内容存档于28 July 2018）. ^ Abdul Karim; Shashiah; Abdul Rahman; Yusup; Abdullah; Mohd Jinis. Management of mangrove forests in Johor - as part of the coastal ecosystem management. Sultanah Bahiyah Library, Universiti Utara Malaysia. 2004 [27 July 2018]. ^ 45.0 45.1 Eric Bird. Encyclopedia of the World's Coastal Landforms. Springer Science & Business Media. 25 February 2010: 1119–1120. ISBN 978-1-4020-8638-0. ^ A. Selamat; H. Fujita; H. Haron. New Trends in Software Methodologies, Tools and Techniques: Proceedings of the Thirteenth SoMeT_14. IOS Press. 29 August 2014: 119–. ISBN 978-1-61499-434-3. ^ Marine Gazetteer Placedetails [Malaysian Exclusive Economic Zone]. Marineregions.org. [27 July 2018]. ^ Muhammad Aqeel Ashraf; Radziah Othman; Che Fauziah Ishak. Soils of Malaysia. CRC Press. 22 September 2017: 108–. ISBN 978-1-351-99857-4. ^ 49.0 49.1 49.2 49.3 Summary of the State of Johor Forest Management Plan for the Period between 2006–2015 (PDF). Johor State Forestry Department: 7/71–11/71 [XVIII/XXIII]. [28 July 2018]. （原始内容 (PDF)存档于29 July 2018）. ^ Taman Hutan Lagenda Gunung Ledang. Johor Parks. [28 July 2018]. （原始内容存档于29 July 2018）. ^ 11 Mesmerizing mountains in Johor. Johor Now. 12 November 2016 [28 July 2018]. （原始内容存档于30 July 2018）. ^ Peta Pengkelasan Hutan Mengikut Seksyen 10 (1) APN Negeri Johor. Johor State Forestry Department. [28 July 2018]. （原始内容存档于30 July 2018） （马来语）. ^ 53.0 53.1 Anuar Bin Md. Ali. Flood Inundation Modeling and Hazard Mapping under Uncertainty in the Sungai Johor Basin, Malaysia. CRC Press. 17 April 2018: 33–. ISBN 978-0-429-88949-3. ^ Senarai Lembangan Sungai Bagi Negeri Johor. Basic Information System of Natural Resources and Environment, Malaysia (SMANRE). [28 July 2018]. （原始内容存档于31 July 2018） （马来语）. ^ Johor, Selangor residents shaken by Sumatra quake. Bernama. The Star. 3 March 2016 [28 July 2018]. ^ Poll: One in 10 Johoreans identify as 'Bangsa Johor' first, Malaysians second. The Malay Mail. 19 November 2017 [13 September 2018]. （原始内容存档于14 September 2018）. ^ Francis E Hutchinson; Terence Chong. The SIJORI Cross-Border Region: Transnational Politics, Economics, and Culture. ISEAS-Yusof Ishak Institute. 14 June 2016: 48–. ISBN 978-981-4695-58-9. ^ Foreign Workers in Malaysia: Assessment of their Economic Effects and Review of the Policy (PDF). 世界银行. KNOMAD（英语：KNOMAD）: 16/70. 13 June 2013 [13 September 2018]. （原始内容 (PDF)存档于14 September 2018）. ^ 62.0 62.1 62.2 Taburan Penduduk dan Ciri-ciri asas demografi (Population Distribution and Basic demographic characteristics 2010) (PDF). Department of Statistics, Malaysia: 13 [26/156]. 2010 [15 September 2018]. （原始内容 (PDF)存档于22 May 2014）. ^ Asmah Haji Omar. The Encyclopedia of Malaysia: Languages and literature. Archipelago Press. 2004. * Cynthia Chou. The Orang Suku Laut of Riau, Indonesia: The Inalienable Gift of Territory. Routledge. 16 October 2009: 6–. ISBN 978-1-134-43033-8. * Michael Clyne. Pluricentric Languages: Differing Norms in Different Nations. Walter de Gruyter. 24 May 2012: 413–. ISBN 978-3-11-088814-0. ^ Asmah Haji Omar. Languages in the Malaysian Education System: Monolingual strands in multilingual settings. Routledge. 16 December 2015: 53–. ISBN 978-1-317-36421-4. ^ Johor Permaisuri urges more effort to increase English language proficiency among young people. Bernama. The Malay Mail. 1 October 2017 [15 September 2018]. （原始内容存档于15 September 2018）. ^ Yee Xiang Yun. Raja Zarith: Stem decline in English language proficiency. The Star. 1 October 2017 [28 March 2018]. ^ Ports in Malaysia. 马来西亚交通部. [13 September 2018]. （原始内容存档于13 September 2018）. ^ About. Integrated Container Terminal. [13 September 2018]. （原始内容存档于13 September 2018）. ^ Container Terminal. 柔佛港（英语：Johor Port）. [13 September 2018]. （原始内容存档于13 September 2018）. ^ TLP Terminal. Johor Corporation. [13 September 2018]. （原始内容存档于13 September 2018）. ^ About TLP Terminal. TLP Terminal. [13 September 2018]. （原始内容存档于13 September 2018）. ^ Simon Richmond; Damian Harper. Malaysia, Singapore & Brunei. Ediz. Inglese. Lonely Planet. December 2006: 247–253. ISBN 978-1-74059-708-1. ^ More ferry services between Johor and Singapore. Today Online. The Malay Mail. 11 May 2015 [13 September 2018]. （原始内容存档于13 September 2018）. * Yee Xiang Yun. Johor proposes ferry services to Singapore. The Star. 26 July 2016 [13 September 2018]. * Low Sock Ken. Firms keen on ferry service between Johor and Singapore. The Sun. 21 June 2018 [13 September 2018]. （原始内容存档于13 September 2018）.